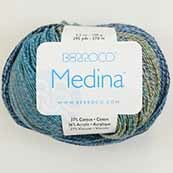 Medina has summer written all over it! The colors range from breezy to tropical and the fiber content is heavy on breathable cotton and viscose. It is a DK weight, so it makes a great layering piece over a camisole or a light shawl for cool evenings. Take advantage of the long color repeat that blends one shade slowly into another for terrific color effects. Please note that due to the unique dye process, some dye may release during laundering.